June, 1554. Former cutpurse and now professional assassin Jack Blackjack has deep misgivings about his latest assignment. He has been despatched to the Palace of Woodstock, where Queen Mary’s half-sister Princess Elizabeth is being kept under close guard. 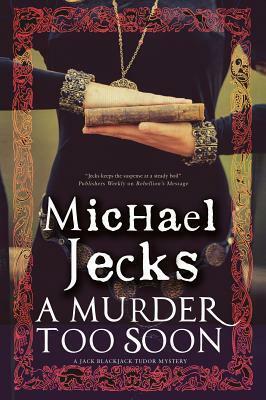 Jack’s employer has reason to believe that a spy has been installed within the princess’s household, and Jack has been ordered to kill her. Jack is one of my favorite characters. No longer a common street thief, he is living well due to the fortune of his benefactor. Only now his benefactor is demanding payment in the form of killing a Lady who is believed to be a spy planted in Princess Elizabeth’s court. Jack balks at this assignment and tries his best to get out of it, but he must pay the piper. When he arrives, he must be sharp and stay focused as he tries to figure out who killed who and why. At the same time, he’s trying to keep himself from ending up a corpse. This is such an entertaining character and series. I enjoy the Templar series as well but Jack is just a great character. Give it a try and you will soon see why! Many thanks for an excellent review!